"For days, the death of a famous journalist has preoccupied many. Including me. For it was nineteen years ago this week that I.F. (Izzy) Stone died. The legendary blogger was 81. "Confused? You say he died years before web blogs were invented? "What he brought to American journalism were the skills of the Talmudist. The ability–no, the impelling need–to pore over obscure and difficult texts. To examine and reexamine. To extract new and unexpected meanings from passages others found dense and impenetrable.... "
"Izzy Stone was critical of Israel, sometimes harshly critical. But so was Isaiah. So was Jeremiah. Izzy’s reasons were much the same as theirs. Like them, he wanted the Jewish people to be better. “One additional item in his illustrious career that deserves notice: Izzy deserves credit for launching the successful campaign to abolish the old House Un-American Activities Committee (HUAC). "In mid-May, 1957, when most civil libertarians were devoting their energies on this issue by just defending the “victims” of HUAC, it was Stone who correctly sensed that the time was ripe for its abolition. "Based on a little noticed U.S. Supreme Court decision (Watkins vs. U.S.) at that time, where Chief Justice Earl Warren pointedly asked, “Who can define the meaning of Un-American activities?”, the Weekly devoted an issue on the HUAC question and Izzy was on the phone to friends all over the nation, including the writer, insisting that not another day be lost. He was most persuasive. Response was immediate: Alexander Meiklejohn, Corliss Lamont, Carey McWilliams, Aubrey Williams, Clarence Pickett, Harvey O’Connor and many more took up the call–through petitions, editorial, and grass-roots organizing, the campaign to end congressional inquisitions started. Hollywood 10's Dalton Trumbo joined Princeton’s Professor H.H. Wilson to pack Carnegie Hall for a kick-off rally sponsored by the then-Emergency Civil Liberties Committee; to be followed thereafter by the creation of the National Committee to Abolish HUAC. "While it took 18 more years to do the monster in, in 1975, the ultimate victory over the committee and for the First Amendment, properly goes to I.F. Stone." "I.F. Stone and Howard Simons, two of the most accomplished journalists of the older generation, died within a few days of one another in June, leaving their trade much impoverished. 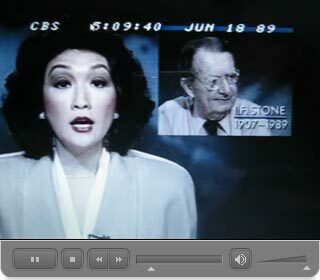 Of the two, I most admired Stone, who epitomized the reporter as outsider. I always thought of him as an old-fashioned solo practitioner, the prototypical muckraker who would sooner go to jail than hold back on a story or fudge the truth to accommodate someone in power." From Requiem for a Radical Journalist by D.D. Guttenplan in NY Newsday, July 13, 1989. The L.A. Times headlined an article on his death as I.F. 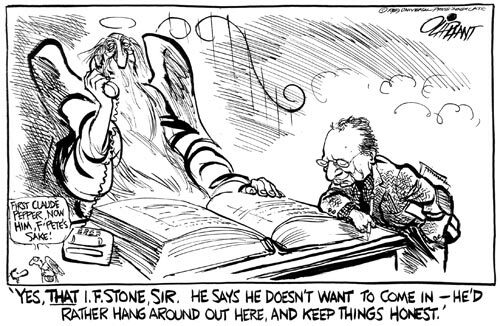 Stone Dies; ‘Conscience of Investigative Journalism,’ (June 17, 1989). Oliphant © 1989 Universal Press Syndicate. Reprinted with permission. All rights reserved. As he once said, it was the first article of Izzy Stone’s faith as a journalist that ‘the intelligence supplied by such a network [as the CIA] is probably a good deal less reliable than that which a careful reader can get for himself from the American, British and French press.' His “retirement” was a kind of hyper-activity. Apart from his work for the New York Review of Books, he began to learn classical Greek in pursuit of his fascination with Socrates, the original gadfly, and would quote copiously at Georgetown dinner-tables. By now the lens of his spectacles were thick as bottle bottoms, and he still needed the help of a magnifying glass to cope with sustained reading, and he wrote his last book on a word processor that produced a text in headline type. When it was announced, as the product of ten years of research and reflection, some formidable indictment of the despised political culture of the Reagan years was expected. Instead, it was a study arguing that Socrates was a cold-minded elitist who effectively contrived his own death sentence to discredit democracy and free speech: “Socrates needed the hemlock as Jesus needed the Crucifixion”, Stone wrote, “to fulfil a mission.” Stone’s last scoop. Nobody understood better than Isidor Feinstein Stone what Washington was all about. He saw it as the greatest guff factory in the world. He flatly refused to deal in this commodity. He neither brought nor sold it in all his years. Because he was self-employed he did not have the troubles of other reporters, who envied or resented him. But he knew what it was like for them. 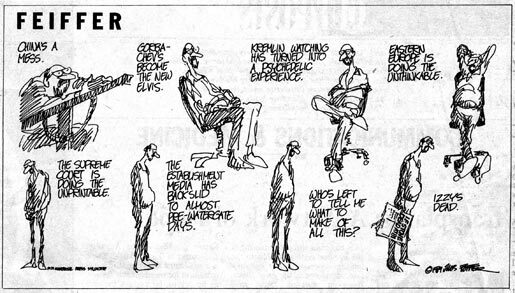 Boston Globe, June 21, 1989. “When I last spoke with I.F. Stone...most of his thoughts were on the prophets: Amos, Isaiah, Cassian, Simon and early Christian ascetics of the desert. Other times, he would phone to pass along breaking news from the third century of Tertullian, the fourth century of St. Jerome and the golden age of patristic literature, or the sixth century of St. Benedict who, in Stone’s time, was a clearer thinker than Augustine of Hippo. 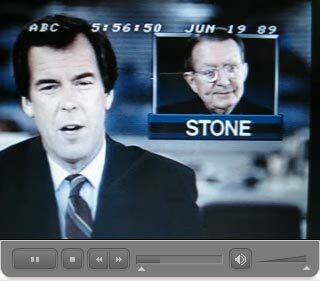 "[one of Stone’s virtues] was to offer whimsical relief from his style of bring-on-the-outrages prose. This article can be purchased here.